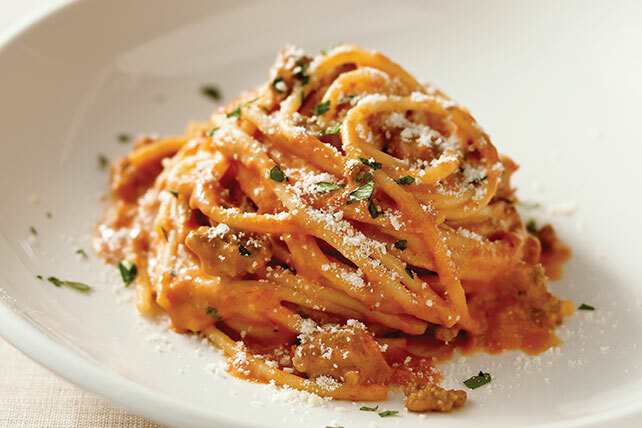 Mix up your routine with our Spaghetti à la PHILLY starring cream cheese! This Spaghetti à la PHILLY is a creamy version of the tried-and-true favorite. Meanwhile, brown meat in large skillet sprayed with cooking spray. Add pasta sauce and cream cheese; mix well. Cook on low heat 3 to 5 min. or until cream cheese is completely melted and sauce is well blended, stirring frequently. Drain spaghetti. Add to pasta sauce mixture; mix lightly. Place on platter; sprinkle with Parmesan. Cook 1 cup each chopped bell peppers and onions along with the meat. Sprinkle with chopped fresh basil or parsley before serving. Thaw and drain 1 pkg. (10 oz.) frozen chopped spinach. Add to cooked meat along with the pasta sauce and cream cheese.